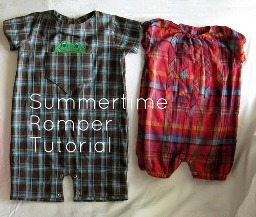 Chris from Pickup Some Creativity shares a free pattern and tutorial on her blog for the Summertime Romper that appeared in the So You Think You’re Crafty competition recently. The pattern is available in size for 18-24 months and 2T-3T. I love this in the lightweight plaid shirtings she used in her examples! There are tons of ways you can embellish them, from cute pockets and appliques to ruffles and frills for the girls. Get the free pattern and tutorial. I can’t seem to download the pattern for your romper. Can you help me.